The 10.1.3.3 MQSeries adapter supports the outbound synchronous-solicit-request-response scenario through use of several InteractionSpec properties. In this scenario, the adapter enqueues a normal/request message in a queue and expects the report/reply synchronously. The report/reply message arrives in the replyToQueueName of the normal/request message. However, if you try to configure the MQSeries Adapter in JDeveloper for an ESB project, the radio button Send Message from MQ and Get Reply/Reports is grayed out. It is not grayed out in BPEL projects though. 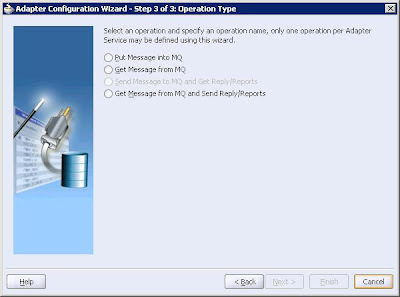 Send Message to MQ and Get Reply/Reports creates 2 separate 1-way operations while the Get Message from MQ and Send Reply/Reports creates 1 synchronous 2-way operation. The MQSeries Adapter supports the request-reply pattern both as a client and a server for BPEL. However, Send Message to MQ and Get Reply/Reports which sets up a reply queue is not supported in ESB. ESB is stateless and does not support asynchronous request-reply pattern out-of-the-box.